Datsun India launched the highly-anticipated Datsun redi-GO 1.0L, equipped with the iSAT engine, which features more power, style and convenience for customers. Priced from INR 3,57,333 deliveries to new owners will commence today at all Nissan dealerships across the country. 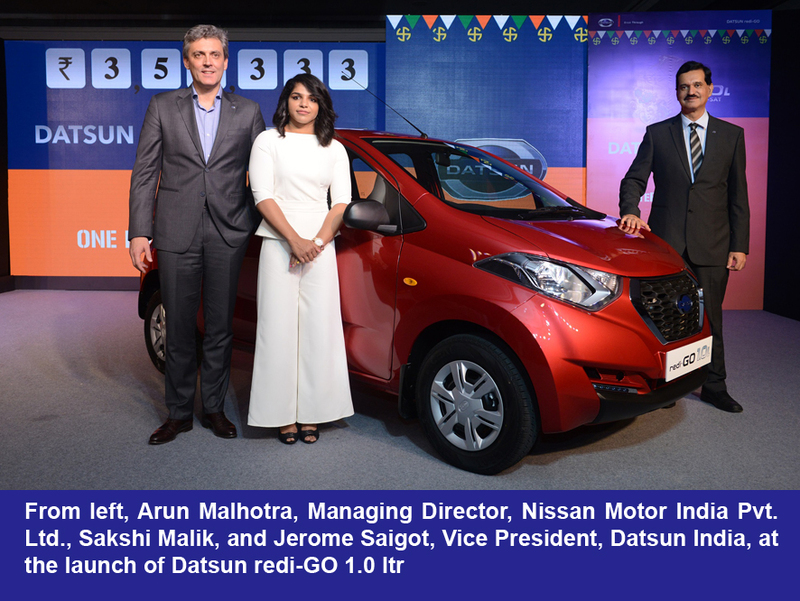 Datsun redi-GO brand ambassador Sakshi Malik, India’s first female wrestler to win an Olympic medal, was present to launch the more powerful Datsun redi-GO 1.0L version. The Datsun redi-GO 1.0L is powered by the Intelligent Spark Automated Technology (iSAT) 1.0L three-cylinder fuel efficient engine, paired with a five-speed manual transmission, to enhance the driving experience for owners. Additionally, it comes in two trim levels, T (O) and S, with new features such as central locking and remote keyless entry; black interiors; and silver finish on the AC vents and horn pad. The car is available in five body colours: Silver, Grey, Ruby, Lime and White. Launched in India in June 2016, Datsun redi-GO combines the roominess, agility and efficiency of an urban hatchback with best-in-class ground clearance (185mm) and high seating position. The Datsun redi-GO 1.0L brings together other best-in-class features, such as front visibility, shoulder room, rear knee room, with brisk acceleration thanks to more power coming from the new engine.